A positive statement by the Swedish authorities on that Sweden would consider asylum for Mr Snowden, will help the world to better understand the real libertarian and independent spirit of the Swedish people – an aspect that has been sadly obscured in most recent years due to the abandonment by Swedish authorities of the traditional non-aligned stance of the nation. Also, it will help stimulate anew dialogue to resolve the issues at stake and that have thrown a shadow over our sovereignty, such as the management of the case against Mr Assange. Beyond the alleged case of Sweden vs. Assange, or the alleged irregularities of the case, the issue for Sweden is ultimately the question of self-government and of whether Sweden can reassume – as many of us dearly wish – the world podium of No. 1 country in fairness and justice, in political beauty and respect for human rights to all. World opinion is already on the side of Mr Edward Snowden, who is currently a refugee in an International airport, deprived of his national passport, and due to exposing massive spying by the U.S. on friend and foe alike. I understand that one of the problems faced by Mr Snowden – in case he would try to implement the asylum granted by Venezuela – is the need of a travel-document. Another reported problem would be the long and allegedly insecure route. Further, if Mr Snowden would be unable to take up asylum in Latin America, and thus forced to accept asylum in Russia, he will be bound of not declaring any thing that could be considered detrimental, as “to harm” the U.S. Certainly, Mr Snowden’s endeavour has never been “to harm” his country intentionally. He just exposed the fashion in which – in my opinion – the U.S. government it does harm the privacy and personal integrity of the core of his country – the citizens. Not to mention EU, Asia and Latin-American institutions and peoples, who have also been treated as enemies via this massive indiscriminate spying. Nevertheless, the question is also, is the shelter offered by Russia worth the cost- being banned from revealing further information? When Sweden gave me political asylum after my revelations at the Russell Tribunal on Latin America in Rome 1974, they never put any condition on that I would have to promise stop the whistleblowing on Pinochet’s Junta or about the aggravating role of the U.S. in the military coup. Sweden has a notable tradition – in fact historical – in providing asylum for political and/or humanitarian reasons from the 60´s and onwards. Unfortunate episodes in which some officials, at some politician’s orders, have done otherwise, should not supplant facts at large. For instance, during the Vietnam-War era, Sweden was a refuge for American “vapenvägrare [conscientious objectors]” (a fact which is not well known by younger generations outside Sweden); the list of historical episodes in which Swedish diplomats have, at the highest personal risk, helped political dissidents or ethnic-persecuted peoples and brought them into Swedish territory is also notable. The most well known examples are, of course, those of R. Wallenberg and, more recently, Ambassador Edelstam in Chile. 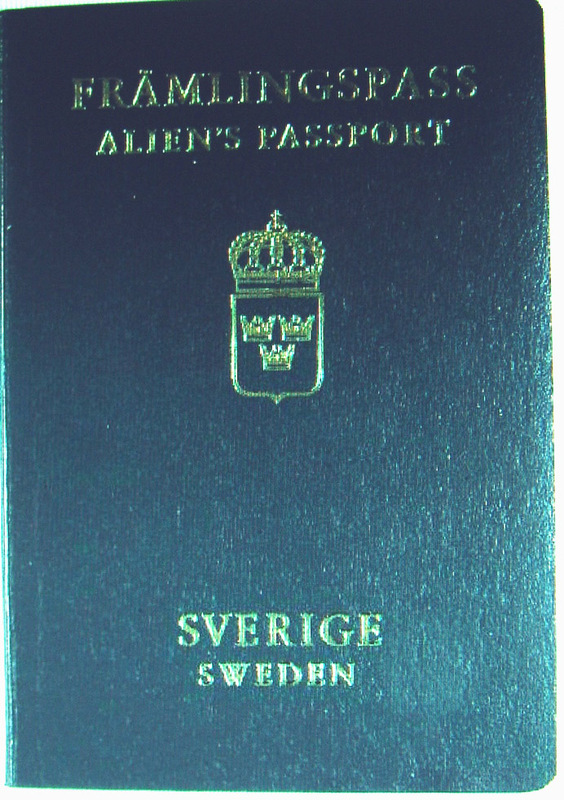 Unlike many other countries, for instance countries of Latin America, Sweden has not made it (in absolute terms) compulsory for the refugee applying for asylum to produce travel documents at the border. I have read, and heard, of migrants – allegedly political persecuted – that are admitted to the country although reporting their travel documents were lost during a long travel, not-seldom amid a smuggling endeavour. Another indication of this irregularity is the significant category “papperlösa” [paperless] amongst the immigrants or refugees in Sweden. It is mainly referred to immigrants whose residence-applications have not been approved by the Immigration Authority, and thus they go underground. However, the “paperless” immigrants have in Sweden right to certain social welfare, such as emergency ward at public hospitals. Here we have also to distinguish between the possession of travel-documents (such as a national passport, or Geneva-Convention aliens’ passport – främling pass), and the understandable need of verifying the individual’s identity. In this sense, the situation for Mr Snowden is quite more favourable (he does not have travel papers but his identity is fully verifiable). I have myself criticized that collaborationist stance in my columns and have argued (I still do) for a returning to a geopolitical stand of non-alignment and non-intervention. I am convinced that geopolitical Neutrality, together with reliance in our own, independent military might, best service Sweden’s national security interests. Also, a Neutral Sweden can best serves the world at large, as it was during the times in which Sweden’s mediation in complex international conflicts served world peace. That task enhanced and maintained the international stature of Sweden. Thus, although a “non-alignment doctrine” would mean non-intervention in military terms, it would also mean political and diplomatic intervention to the highest degree. There are millions and millions of “Third World” children, women and men that will be grateful to Sweden for that. As it was in the past. On the other hand, the possibilities that some amongst the most eager or passionate “Pro-U.S.” politicians would advocate for the extradition or ousting of Mr Snowden would be still there and it is not likely they will disappear completely from the debate. Neither would that stance disappear in Ecuador or Venezuela, for that part, in case Mr Snowden ends there. Sweden is unlikely to allow extradition to the US if the death penalty is involved, as that would violate Swedish law. The average Swede, the one electing the average politician, does indeed consider Snowden a whistle-blower and in Sweden we have the Swedish protective-legislation on whistleblowers-related behaviour. And for those argueing that Swedes are prone to follow U.S. fashions, well, in this case it would be positive if true: It is already known that the majority of Americans, according to recent poll, do consider Snowden a whistleblower and not, as has been asserted by the U.S. government and associated news media, a “spy” or “traitor”. 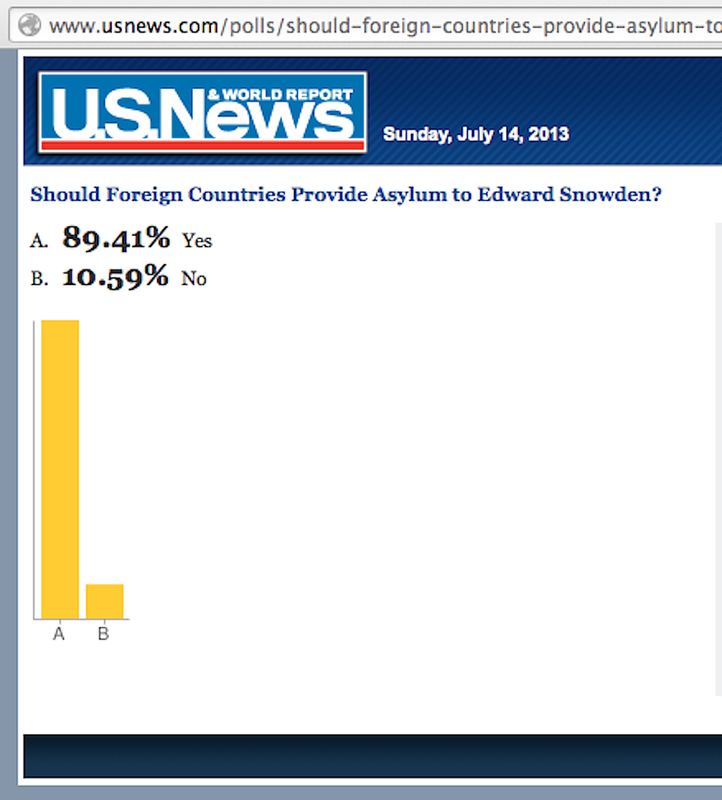 And, in the context of this appeal, most revealing is one U.S. News poll on whether Foreign countries should provide asylum to Mr Snowden. See update below. With regard to the “case Assange”, the international position of Sweden has suffered due to a two-fold stance. On the one hand, because of the treatment given to the legal case, and secondly due to the public stance of some high-profile Swedish politicians and journalists have taken on the person of Assange. On the other hand, this “case” has evolved parallel to an increasing openly alignment by Sweden with U.S. interests, not only militarily and at geopolitical levels, but also in matters of information-sharing, intelligence cooperation and protection of American industrial businesses and copyrights. Some of these themes, such as free information, are part of the main profile of WikiLeaks. From an international perspective – Swedish authorities seem to be unwilling to end the case (for instance by interrogating Mr Assange in London) and are insisting an extradition to Sweden despite other reasonable options. I have gone into this in detail in several articles in my blog. This situation around the case against the WikiLeaks founder – even considering that the allegations in Sweden are not formally related to Assange’s anti-secret organization, become over time more complicated and the impasse harder to deal with – for all concerned. I accept that others may disagree with this assessment of Sweden’s case against Assange. However, the above summary might be a fair description of how the international community broadly –at least in social media – perceives the situation. Right or wrong factually, it is in any case a sad situation for Sweden, because it does not do justice to the tradition of Sweden as both a sovereign, neutral, independent, and loving-peace nation. I firmly believe that this – to declare openness towards the whistleblower’s asylum – is also an opportunity for Sweden. As it is as well –attending to the present circumstances – a good possibility of a refugee for Mr Snowden, namely amid a society which shall not limit his freedom of expression. Finally. I believe I know the Swedish domestic panorama fairly well. That is why I dare to go on with this proposal – against the known odds. For although I have Italian ancestry, or I live in Italy, I am in fact myself a Geneva-Convention political refugee from Chile, and I became a Swedish national 1979. I am one of the founders of MIR and as both a militant in the Chilean resistance against Pinochet and a prisoner in the Stadium and Quiriquina Island Prisoners Camp, I have borne witness to the earnest solidarity, and audacity, of previous Swedish governments and their envoys. 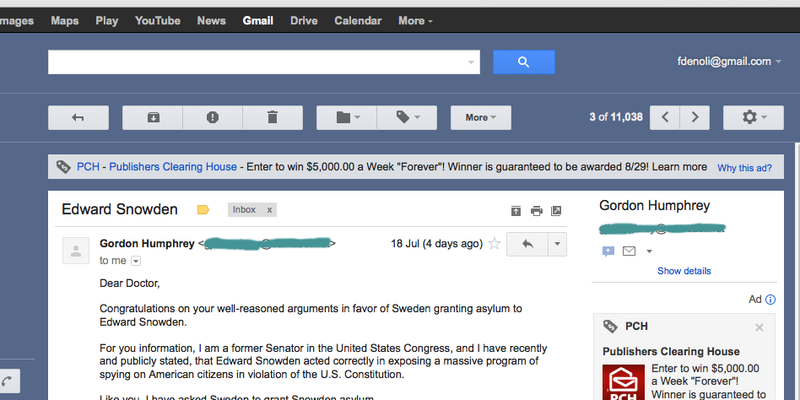 Thus, I dare to recall that honourable Swedish tradition and ask all Swedish political parties to endorse a proposition of asylum for Mr Edward Snowden. As Mr Björn Brändewall, from the Liberal Party in Kalmar put it recently, “the revelations of Mr Snowden show that an American government agency spies on its own people in violation of the country’s Constitution” [“Snowdens avslöjanden pekar på att en amerikansk myndighet spionerar på det egna folket i strid med landets konstitution”, Fria människör hittar lösningar, 8/7-2013]. I remember vividly when the Pinochet government revoked my constitutional right of renewing my passport, making me stateless, after my testimony at the Russel Tribunal in Rome 1974 exposing the killings, torture and horrible crimes perpetrated by the Junta in the Prisoners Camp in which I have been confined. Helped by lawyer Hans Göran Frank (one of the founders of Amnesty International Sweden), I obtained political asylum and a främnlingpass (alien’s passport) according to the Geneva-Convention in a matter of weeks. ALL the Nordic countries should be offering Edward Snowden aid and all should also be demanding explanations from the U.S. ambassadors in their countries of the extent of U.S. spying on their citizens. The fact that Snowden revealed spying on the EU in both Brussels and Washington D.C. by the United States and EU countries chose to force a president’s plane to land because of suspicion Mr. Snowden was on board is deeply disturbing. As you recount, there was a time when the Nordic countries took a stand for justice and aided political refugees and dissidents. It is good someone reminds current leaders of that. Yes, offering aid to anyone who acts on conscience should be policy in Nordic countries. Who else will show an example to today’s generations by being part of a select few that cherish truth and morality more than the almighty dollar. I appreciate Professor Ferrada-Noli thoughts about Sweden’s historical record in the 1970s in granting sanctuary to Chileans and Vietnam war resisters. And it would be marvellous to see it return to that position. However, Kevin Townsend is more realistic. I read recently an article by Assange that 80% of the present Swedish Cabinet studied in the USA. Foreign Minster Carl Bildt was one of them and he established close personal ties with the notorious neo-con hawk Karl Rove–Bush junior’s election strategist–who also now acts as an advisor to Reinfeld. A majority of Swedes are peace loving people who would no doubt like to see Snowden given asylum but the fact of the matter is that it is the unaccountable and corrupt Swedish military-intelligence complex that calls the shots in Sweden until such time that the Swedish workers take the power from it. It would be suicidal at present for Snowden to seek asylum in a Sweden whose government is perhaps the most pro-US in Europe (along with the UK). Assange has made the same assessment about his own case. While the temporary surrender agreement with the US is still in force, it would be very easy for the Swedish government to betray Snowden and Assange to Obama. Snowden has already completed his task of providing his revelations to the media. Greenwald et al are not going to stop publishing them and Snowden has stated that he does not control what they publish. It is ridiculous of Putin to insinuate that Snowden must “stop harming the US” as a condition for asylum. This is complete nonsense. Snowden’s revelations do not harm the US. On the contrary they serve to defend the progressive democratic protections of the US Constitution and specifically the Bill of Rights while the NSA undermines them.